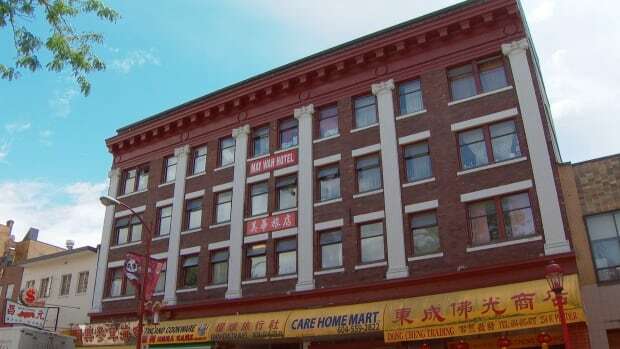 The Vancouver Chinatown Foundation says it is in serious talks with the Shon Yee Benevolent Association, the hotel’s owner, to purchase the building on East Pender Street. “Our plans are to partner with the Shon Yee Association and try and figure out what the future is for the May Wah Hotel,” said the foundation’s chair Carol Lee. Nerves were rattled earlier this summer when the association put the building up for sale. There were concerns the building’s 120 low-income tenants, the majority of them senior-aged women, would be displaced. Although no paperwork has been signed as yet, both sides are feeling hopeful. Erik Kwok, the real estate agent in charge of the sale, called the foundation the “perfect” potential buyer for the $10-million building. “Most other buyers are just buying to generate more income, so this one is more to our liking … so everybody’s happy about it,” he said. He says a second round of proposals has been submitted to his client for review. If the client is happy with the terms, Kwok says the deal could wrap up as soon as the end of January 2017. The Vancouver Chinatown Foundation has already committed to two other projects in the community. It purchased the property at 168 Pender Street, the former home of a Bank of Montreal, and hopes to build a storytelling centre in its place. A little further away at 58 West Hastings Street, the site of a controversial tent city, the foundation has leased the land and will help build and operate a health centre in partnership with Vancouver Coastal Health. Lee says the foundation has been mobilizing since 2012 with the goal of revitalizing the neighbourhood. “We hope that in a 100 years from now, we’ll have a very vibrant Chinatown that has retained its irreplaceable cultural heritage,” she said. On Wednesday, some of the city’s most influential and wealthy residents gathered for the foundation’s inaugural gala. Lee says more than $1.5 million was raised and she believes it will go towards the planned storytelling centre and potentially the May Wah Hotel. About a handful of other individuals have reportedly committed to donations of $1 million each, according to social media posts, but Lee says those details are still being worked out. This entry was posted in 發展項目 Development Projects, 新聞 In the News and tagged #ChinatownRevitalization, #MayWah, #revitalizeChinatown, #VancouverChinatownFoundation. Bookmark the permalink.